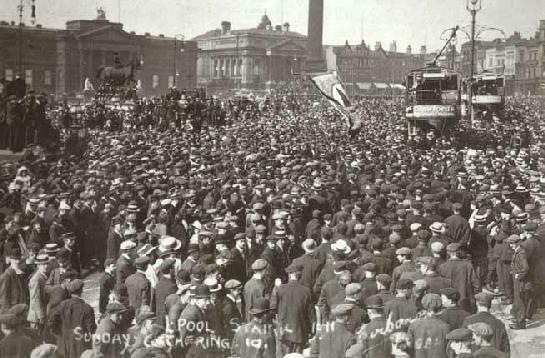 A short history of the strike movement that took hold of Liverpool during the summer of 1911. Culminating in a massive general strike of all transport workers, the movement displayed some of the most extraordinary scenes of class solidarity seen in Britain. The strike movement of Liverpool occurred during the great period of industrial unrest that was to grip Britain between 1910 and the outbreak of the First World War. Beginning with a walk-out of seamen, the strike soon snowballed and went on to reach epic proportions, involving up to 70,000 people. The general election of 1906 had seen a close Liberal victory. Elected on the promise of widespread reforms, the government proclaimed the beginning of a campaign against "landlords, brewers, peers and monopolists", as well as launching schemes such as national insurance and old age pensions. However, this policy of continuing reform came to an abrupt halt in 1910, when the government could simply no longer afford to carry on its program. Faced with competition from rapidly expanding industry in Germany and America, the country was in a period of economic decline which saw wages drop by 10% from 1900 to 1910. Continuing increases in the cost of living also reached endemic proportions. With this failure by the Liberal government, and the prospect of massive reductions in wages looming, the coming of widespread strikes was only a matter of time. Liverpool soon emerged as the centre of this movement. 1910 had seen the founding of the Transport Workers Federation (TWF), a union which aimed to bring every transport worker in the country into the same organisation. Led by the famous syndicalists Tom Mann and Ben Tillett, the union was imbued with an anti-parliamentary feeling largely alien to the trade union movement in Britain at the time. The TWF grew over the next year as existing transport unions began to affiliate to it, bringing thousands of workers with them. A huge demonstration organised by the TWF took place in Liverpool on May 31 1911. Called in support of two seamen's unions on strike, thousands of workers marched across the city carrying banners in support of the strike. Ending at St. Georges Hall, Ben Tillett and other syndicalist leaders addressed the crowds, calling on them to assist the strikers in whatever way they could. The strike was organised by two affiliates of the TWF, the National Sailors and Firemen's Union (NFSU) and the National Union of Ships' Stewards, Cooks, Butchers and Bakers. Beginning as a protest against degrading medical inspections, the strikers soon raised further demands; including improved accomodation, an increase in wages, union recognition, the right for union stewards to be present during hiring, and an end to the medical inspections. Under pressure from a militant rank and file, leaders of the NFSU soon began to press the employers' organisation, the Shipping Federation, for talks aimed at ending the dispute. Met with silence from the Shipping Federation, workers responded by calling a national strike on June 15. Joined by all workers employed by the shipping companies; from cooks and stokers, to stewards and onshore workers, the national strike was total. The pressure of the strike, coupled with the fact that many scabs used to break the strike were completely untrained, forced the companies to back down and concede to the unions in late June. Hearing of the victory of the seamen, 4,000 dockers immediately walked off the job on June 28 demanding improved pay and conditions. The dockers, many of whom had refused to load ships during the national strike, were quickly followed out by the scalers and coal heavers, and by the end of the day 10,000 men were on strike. Seeing this, the seamen again walked out on strike again purely in support of the dockers. Mass meetings were held, and the largely un-unionised dock workers began to flock to the National Union of Dock Labourers (NUDL). Within a week the Shipping Federation had caved under the pressure of the strike. While no general agreement was agreed for all the companies, most struck a deal with the NUDL based on improved hours and pay, and an end to discrimination of union members. The following month saw wave after wave of strikes in Liverpool, not limited to the dockside. Encouraged by the victory of the seamen and dockers, the tug boat workers walked out in early July, soon followed by labourers from the massive Stanley Dock tobacco warehouse, brewery workers, then workers from the rubber plants, oil mills and wool warehouses. August 5 saw a walkout at several depots by railwaymen after weeks of petitioning their company for reduced hours and an increase in pay. Represented by an mostly ineffectual union that had spent the last four years giving way to company demands on government initiated conciliation boards, even going so far as to sign a no-strike agreement, the railwaymen launched an all-encompassing strike in the hope of forcing their union leaders to support them. 15,000 railwaymen were on strike by August 7. Picketing at stations throughout the city, serious disturbances began to break out between strikers and police, some leading to full-scale riots. Thousands of extra police and soldiers, many being issued with live ammunition, flowed into the city during the following days. Joined by dockers and other transport workers striking in sympathy, the railwaymen soon bought any transportation of goods in Liverpool to a complete halt. Claiming that the dockers were in breach of their deal with shipping companies agreed a week before, the Shipping Federation declared a lock-out, and attempted to use soldiers as strikebreakers. As the rail strike began to spread across the country, a mass demonstration in Liverpool was declared as a show of support. Taking place on August 13 at St Georges Plateau, 100,000 workers came to hear speeches by workers and leaders of the unions, including Tom Mann. The demonstration went without incident until about 4 o'clock, when, completely unprovoked, the crowds of workers suddenly came under attack from the police. Indiscriminantly attacking bystanders, the police succeeded in clearing the steps of St George's Hall in half an hour, despite resistance from strikers who used whatever they could find as weapons. Fighting soon spilled out into nearby streets, causing the police and troops to come under attack as workers pelted them with missiles from rooftops. Becoming known as Bloody Sunday, the fighting resulted in scores of injuries on both sides. Fighting across the city continued for several days, coming to a head when a group of workers attacked a prison van carrying some arrested strikers. Two workers were shot dead by troops during the ensuing struggle, one a docker and the other a carter. A general strike of all transport workers in Liverpool was arranged for the night of August 14, and the next day saw the city come to a complete halt. Any movement of goods was closely guarded by troops, most of whom were drafted in from outside of Liverpool as the territorials of the city had largely been confined to barracks, the authorities wary of their loyalty. However, the strike's days were numbered. Under intense pressure from the government to end the dispute, the railway employers and moderate leaders of the railwaymen's union began a series of talks. A deal was struck ensuring that all strikers would be reinstated, and the railwaymen returned to work on August 21, with a general return to work ordered for the next day. Sporadic rioting occurred in working class districts throughout the end of August. The show of strength displayed by the transport workers of Liverpool in 1911 clearly demonstrated the material gains that could be won through cross-industry solidarity. Paving the way for the massive industrial revolts by British workers during 1910-1914, the strike movement inspired similar action throughout the pre-war years. Interesting and useful article. Cheers! Note: The attempt by strike committee leaders including Tom Mann to get a return to work pending negotiation of the dockers' case was greeted with considerable opposition. Mann himself was heckled and shouted down by unofficial leaders and strike crowds. It took a week of mass meetings to overcome this resistance. By the middle of July, however the dockers reluctantly agreed to negotiations. By the time these were completed in early August, however, the second stage of unrest had broken out. Interestingly there is a short play by Rob Johnston called 'Rid The World' (an adaptation of Such Impossibilities by Trevor Griffiths) on at the Lowry in Salford this week about these events and in particular the role of Tom Mann - Has anyone else seen this before? They sometimes have a discussion after these plays so if I get time I might re-read a bit of Bob Holton's useful book beforehand and comment on this again when I've seen it myself. We went to see this play (as above) last night and were a bit disapointed. It was a brave attempt but despite the rousing finali it cam accross as a bit wooden. Tom Mann was portrayed as a good organiser but also a bit of an arrogant type - not sure if that was accurate or not, and the representative docker as an honest but fairly ignorant militant. Given the current economic and political climate they missed an opportunity to use the handouts to inform people of the background to the strike wave or to hold an after show discussion. Perhaps we expected too much from something which appeared to be connected with the whole current establishment celebration of Liverpools Radical History. We had recently seen in the same venue a much more 'professional' and inspiring performance of a play about Paul Robeson which also had a useful after play discussion so a double disapointment really.